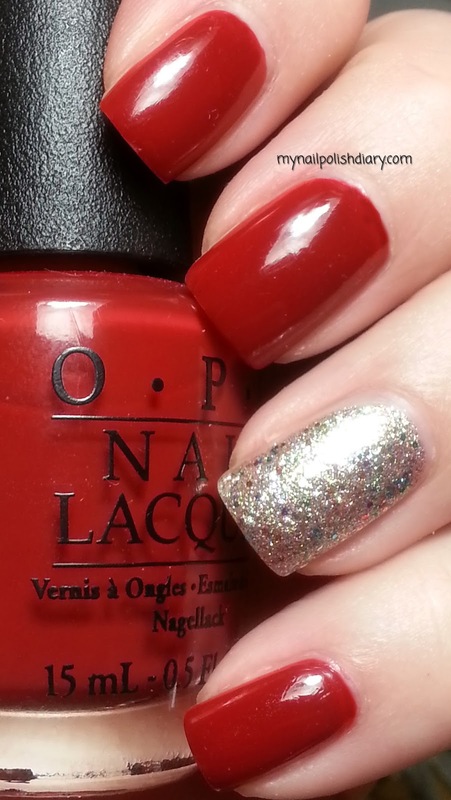 OPI First Date At The Golden Gate is part of the San Francisco collection that was released fall 2013. It's a dark brick red with a little brown. This is just perfect for a gorgeous fall day. I wish it was cooler outside but I can't complain since it's so pretty! The formula was perfect. It glided on like it knew how much I was going to love it. No complaints :D This is two coats with top coat. For my accent nail I used China Glaze Ray-diant. What a stunning pop this accent nail turned out to be. I love silver with red. Maybe more Christmas than fall since gold would have probably been a more fall look. Oh well, who cares?!? Not me. Ray-diant was released in the Prismatic Chroma Glitters collection in spring 2012. I've had this a while and the formula is still awesome. I love this collection. It's the perfect addition to any mani. I did two coats with two coats of top coat to smooth.